Clinica Sierra Vista lends a hand to the neediest among us, the last house on 24th Street goes down and how long before someone calls for the removal of the state of Father Garces? medical services to the poor and needy, opened its doors at its Old Town Kern facility to provide free haircuts, breakfast burritos, HIV testing and screening for glucose and high blood pressure. * ... FRANKLIN: A sign of the times about traffic and growth: parents of students going to Franklin Elementary downtown have been told that walking their kids to school on busy Truxtun Avenue is too dangerous because of the speeding cars. Instead, they now must enter the school from the rear entrance on 18th Street. 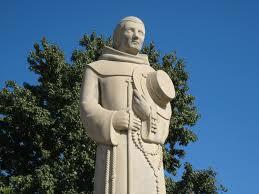 * ... FATHER GARCES: How long do you think it will take before someone calls for the removal of the statue of Father Francisco Tomas Garces at the Garces traffic circle? Is he a symbol of the white European repression of native Indian tribes, or an inspiration as one of the first Europeans to discover California? Take your pick. * ... SPOTTED ON FACEBOOK: "I thought I felt a cold breeze but it was just my mother's sighs of disappointment." * ... SPOTTED ON TWITTER: "If anyone asks, I'm drinking all this wine to collect corks for a Pinterest project." 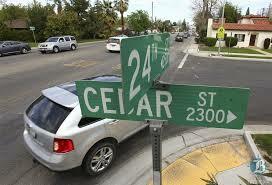 * ... 24TH STREET: The last house standing in the way of the 24th Street widening is being demolished this week, clearing the way for the next phase in what will be a long process to improve the road. Next up: installation of sound walls on the north side of 24th. * ... OVERHEARD: A downtown resident is telling friends about a homeless woman who showed up at his door one evening past 9 p.m. "She was holding two Ramen noodle cups and asked me for hot water. I turned on the hot water and looked back and she was inside my house. When she saw I had ordered a pizza, she said 'Can I have some?'" * ... PEOPLE IN THE NEWS: Providence Strategic Consulting Inc. has announced that two local business women have become affiliated with the firm. 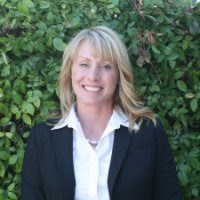 They are Kristin Hagan, a local attorney, and Kim Schaefer, a political and public affairs advisor who most recently was the public face behind the successful effort to rescind the PACE (Property Assessed Clean Energy) program. * ... WEEKEND MOVIE: Playing locally here at the Maya Cinemas is a movie called Wind River starring Jeremy Renner and Elizabeth Olson. It is one of the most highly anticipated movies of the year and is touted as a moving, dark drama set on an Indian Reservation. Olson plays an FBI agent sent to Wyoming to investigate a murder. Worth considering for your weekend enjoyment. 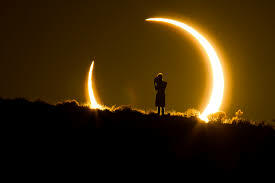 percent blackout, fly to Salem, Oregon on the west coast or Charleston, S.C. on the east.) Folks are already stocking up on "eclipse glasses" or building their own pinhole projectors. Binoculars can be used but only if you have slide-on filters to protect your eyes. * ... SPOTTED ON FACEBOOK: "Amazing things will happen today if you choose not to be a miserable cow." * ... STEAK: The most popular local image on Facebook last week was a 33-ounce tomahawk ribeye steak being served at Luigi's Delicatessen. 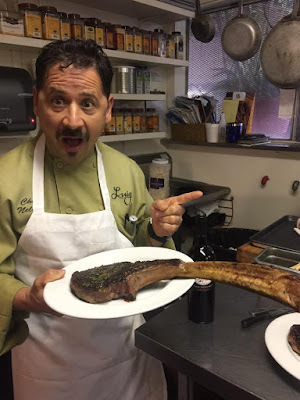 Enough to feed four or more people, the tomahawk is a stunning culinary masterpiece that that costs the princely sum of $75. When Luigi's served it Friday, Facebook exploded with posts showing folks consuming this meat lover's special. 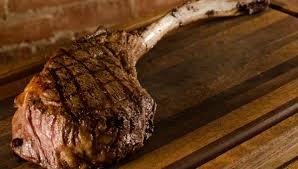 KC Steakhouse also serves the tomahawk and given its popularity, expect to see it served elsewhere. 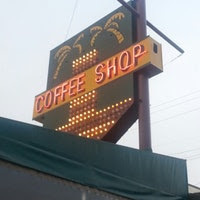 * ... GOOD EATS: And speaking of our iconic local eateries, I dropped into the 24th Street Cafe on Saturday for a post exercise caloric experience. There are few more entertaining places in town to eat than at the cafe's friendly counter enjoying a deep menu and crisp service while watching the world go by. 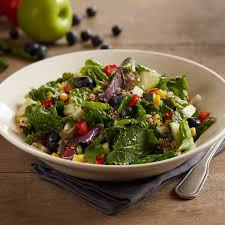 * ... MORE EATS: As long as I am talking about food, I would be remiss if I didn't mention an impressive "superfood" salad available at BJ's Restaurant off Stockdale Highway in the Southwest. Perhaps one of the best and healthiest salads I have had in a long time, it features baby kale, Romaine lettuce, Peruvian quinoa, sliced apples, fresh blueberries, diced cucumbers and tomatoes, jicama, sweet corn and asparagus. * ... GOOD FORM: Congratulations to Dr. Tom Gordon and Bakersfield West Rotary for sponsoring 30 needy children for a 'back to school' shopping spree. Vija Turjanis of Kern Behavioral Health and Recovery Services said Rotary West has been doing this since 2005. The kids were given $100 each to shop at Kohl's. * ... GRAPEVINE: John Kelley added this note to my recent piece about how the Grapevine was named: "Richard to add to your blog on the community of Grapevine, as you printed Grapevine Canyon was named by Don Pedro Fages, ( La Canada de Las Uvas ) which translates to 'The Canyon of the Grapes.' The grapes are Cimarron Grapes, they grew so profusely the soldiers under Fages had to hack their way through them. Don Pedro Fages was chasing army deserters. Also Don Pedro named Buena Lake, and the area he viewed was a labyrinth of lakes and tulares. Many people believe that Father Francisco Garces was the first white man to enter the San Joaquin Valley; not so Don Pedro Fages was there four years ahead of Garces."